You Made Us a 2018 St. Louis Best in Value St. Louis Website Design Company – Again! For the first time in company history, IQComputing has won a “best in” award twice in the same year from the St. Louis Small Business Monthly! This time we were selected as a “Best in Value” company, which marks the third year you bestowed upon us this honor. Earlier this year we were selected as a “Best in Quality” company. January was the first time we won the designation of “Best in Quality.” 2018 is the ninth consecutive year we have been named to the “Best In” list in at least one category. IQComputing offers a variety of services in the areas of web design, digital marketing, graphic design, hosting and add-ons. IQComputing has been developing visually impressive and budget-sensitive responsive websites in St. Louis, Missouri since 1998. 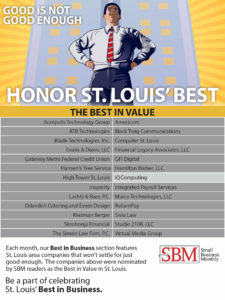 The St. Louis Small Business Monthly magazine, which publishes editions for six St. Louis-area counties, has been in business since 1988. The magazine keeps readers of privately-owned small businesses in the counties it serves informed about the latest best practices, business advice and inspirational trends that are helping businesses succeed. The magazine sends out an annual survey to determine, from actual customers, which small businesses deserve the “best in” recognition in 14 categories. For 2018, the St. Louis Small Business Monthly awarded 60 companies the “best in” designation across 14 categories. Over nine years, IQComputing has won awards for Best in Quality, Best in Value, Best in Reliability, and Best Web Design Firm. 2018 is the first year we won two “best in” awards. Contact IQComputing at (636) 594-5552 for more information on creating your website, redesigning your website, digital marketing, graphic design, hosting and add-ons. IQComputing is excited to provide you and your website with the same quality service that has won it the “Best in Quality” and “Best in Value” awards this year.